Say what you will about other aspects of gaming, but one area where mobile games can frequently go toe-to-toe with those on other platforms is in their style. Games like Monument Valley ($3.99), Sword and Sworcery ($3.99), and Prune ($3.99) are as much about taking the player on an audio-visual journey as they are about pushing their gameplay mechanics. 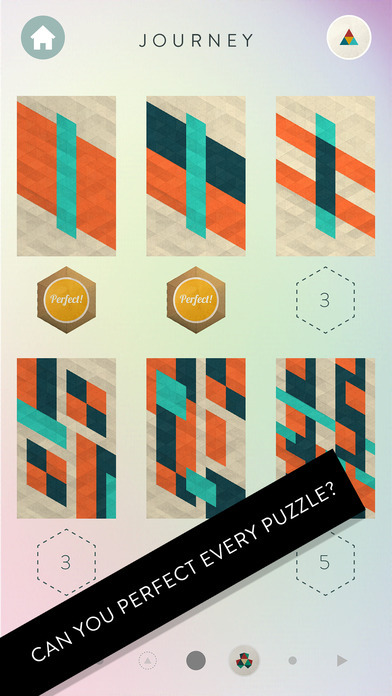 2013 puzzle game Kami ($2.99) might not be as famous as some of those games, but it’s certainly done well enough for itself. It has made the jump to multiple platforms and now has a sequel to call its own. Unfortunately, Kami 2 (Free) runs into a lot of the same troubles that puzzle game sequels usually do, and with much of the novelty of its gimmick worn off, its fundamental issues shine through a little too brightly. 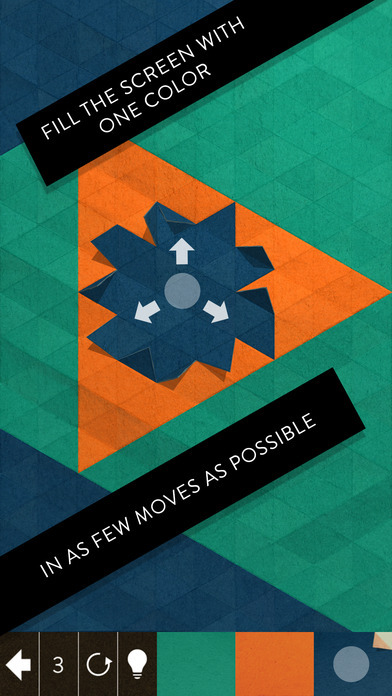 Kami is a game about matching colors with as few moves as possible. It uses folding paper as its artistic conceit, but it’s really more like trying to use the flood-fill tool on a paint program to fill the entire screen with only a few clicks. Each stage presents a multi-colored pattern and a par number you need to aim for. Simply choose a color, tap an area, and all of the connected paper of that color will flip and fold into the new color. Make the whole screen one color and you’re all done. In Kami 2, you have to do it within the par number of moves to actually beat the stage. Do that and you’ll earn a Perfect Badge, which is essential to unlocking medals and opening up new stages. 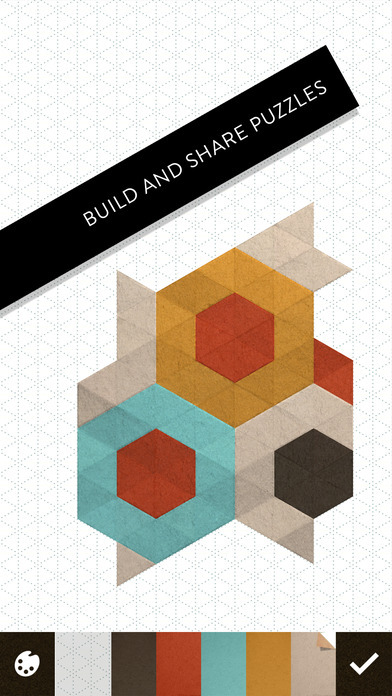 Kami 2 is a lot like the first game, except with much more content. There are over 100 stages in the standard Journey mode, enough to keep anyone busy for quite some time. 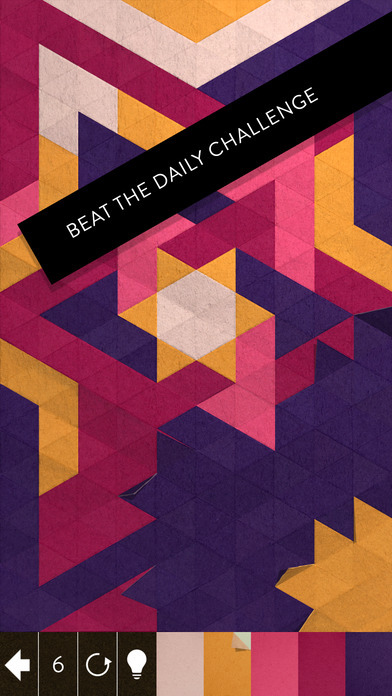 In addition, there are also daily puzzles to solve, and an edit mode where players can create and share their own puzzles. As this game can be had for free as opposed to the first game’s up-front price tag, you’re probably wondering where the catch is. The curious thing is that there really isn’t one. You don’t have to worry about ads, timers, or any of that stuff. Journey mode is fully playable off-line, and while the other two modes require a connection, that makes perfect sense. No, Kami 2 aims to earn its money the old-fashioned way. It wants to make you cry for help, and then charge you for it. Basically, the game monetizes in a few simple ways. The main things it’s looking to sell are packs of hints. If you have hints, you can use them to see exactly one move towards your goal. The game will give you the first one for free, but after that, you’ll have to buy them if you want more. There are also some special palettes you can unlock via IAPs that simply give you some fancy options in the edit mode. The game doesn’t wave these potential purchases in your face. In fact, you probably won’t even see them unless you go looking for them. If you can clear the stages on your own, you won’t need to give Kami 2 so much as a single cent, and there’s nothing stopping you from doing just that if you’re clever enough. Fair warning, though. Kami 2 gets really, really tough. Some of the later puzzles require you to make fifteen or more moves in just the right sequence to meet par, so you’re going to have to think things through carefully. This is where Kami makes a few mistakes, however. I fully appreciate the complex puzzles, and I’m even okay with the par being a requirement for beating the stage. What I don’t like is that if you make an incorrect move, you have to start the puzzle from scratch. With turn-based games like this, the ability to move back even one step is a major convenience. Having to retrace 10 or more moves to get back to where you were isn’t challenging or interesting. It’s just annoying. Even worse, that gorgeous folding animation that plays whenever you swap a color can’t be turned off or skipped. So you not only have to retrace your moves, you have to do it slowly. In earlier levels this is a minor issue, but the farther in you go, the more aggravating it becomes. Besides all of that, Kami 2 suffers from its mechanics getting a little repetitive over the long haul in Journey mode. The game makes a good effort of teaching players as it goes, with the stages arranged in groups of six similar but increasingly complex layouts. The sentiment behind that is appreciated, but so many of the stages feel like filler as a result, and that’s as true for stage 103 as it is for stage 7. I felt more engaged with the first game’s significantly smaller set of levels because each one stood out more. In Kami 2, it feels like you’re told to color a fire engine, then turn the page and color a slightly more detailed fire engine, then color the even more detailed fire engine on the following page. I’m tired of this fire engine already. By far, the better part of Kami 2 is found in the user-created levels. There seems to be a well-populated list with new entries appearing frequently thus far, so it’s already quite active. There are a few different filters to choose from, and users can help curate the levels by giving a little heart to the ones they think are good. They’re not all winners, but there are more than enough to choose from that you ought to be able to find many enjoyable puzzles to solve. The only problem here is that this mode requires you to connect to a server, which is an issue not just in the sense that you need to be online, but also that any server problems will result in the mode not functioning. I only mention this because during the period in which I played Kami 2 for review, I frequently received messages that I couldn’t play the non-Journey modes in spite of my connection being fine. Kami 2 is a gorgeous puzzle game packed with challenging content, but it allows its sense of style to get in the way of a smooth experience for the player. It’s fine that the game throws out difficult and complex puzzles, but the game seemingly goes out of its way to make the process of solving those challenges as tedious as possible. Between its generous pay model, stunning presentation, and heaps of puzzles to solve, Kami 2 is probably worth taking at least a few swings at. It’s at least a few folds away from the gameplay living up to the slick visual designs, however, and there are clearly some kinks to work out with the online modes.